It is one of the silent cities of the dead in Wheeling, but this one was split, and one half has been forgotten. 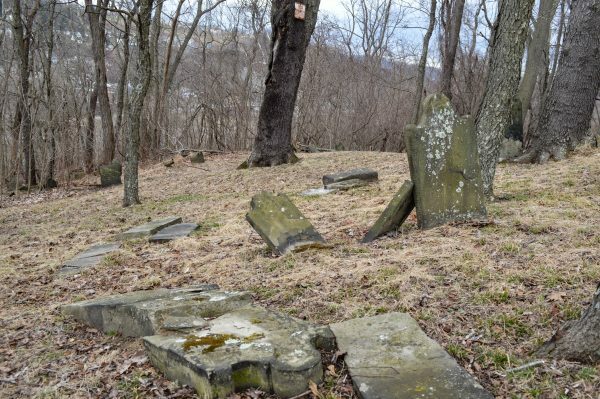 The Peninsula Cemetery, once the third largest in the state of West Virginia with more than 1,700 graves, was initially 22 acres in size until 1964. 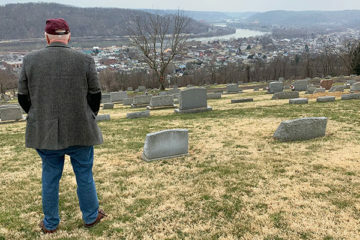 That is when more than 100 coffins were relocated to the Greenwood and Roney’s Point cemeteries to make way for Interstate 70 that runs from Baltimore to Cove Fort, Utah, and in some cases, those remains were moved twice because of the closures of the Hempfield and East Wheeling graveyards. 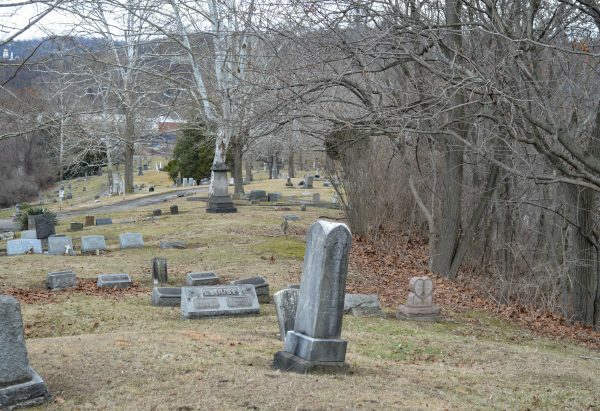 The Hempfield Cemetery, once located on the grounds where the Ohio County Public Library now stands, was removed to make way for the B&O Railroad, and the graves within the East Wheeling Cemetery were removed for neighborhood growth, according to local historian Jeanne Finstein. “Oh, we cared about the people in those graves because the graves were moved,” she said. “As the city grew, there was a need for more land, so they did what they had to do at the time. 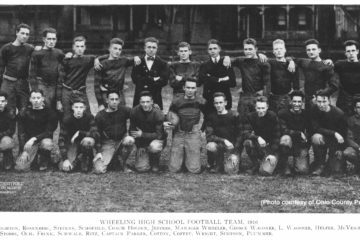 Records do exist and have been preserved by the city of Wheeling as well as Wheeling Heritage, but the majority of the municipality’s residents know very little about its history. The burial grounds this map displays have always been known as the Peninsula Cemetery. 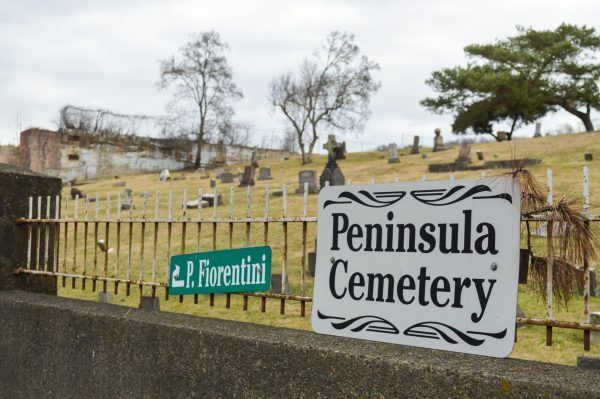 “Not too many people know very much about the Peninsula Cemetery, and maybe that’s because it’s pretty much out of the way,” said local historian Margaret Brennan. “But the same could have been said about the Mount Wood Cemetery until Rebekah Karelis from Wheeling Heritage brought attention to it. 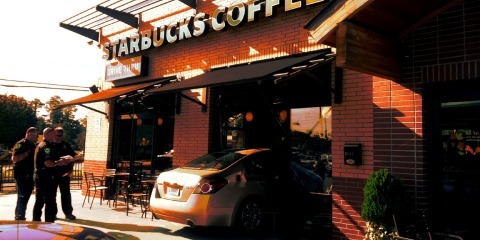 Not only did she shine a light on it, but she’s led the charge for all of the renovations that have taken place so far. 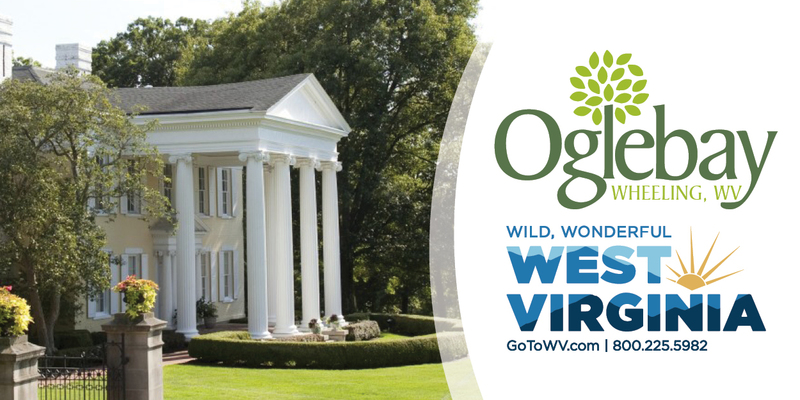 Karelis has collected an abundance of documents on local cemeteries, and she has learned that the Peninsula Cemetery was opened in 1842, 21 years before West Virginia became the country’s 35th state. Also discovered was the existence of the Pest House, a structure that was located near the top of Rock Point Road and housed local victims of smallpox during an epidemic in the 1890s. Despite the presence of many historic grave sites, Blaw Knox once operated adjacent to the Peninsula Cemetery. I-70 was born in 1956 with the passage of the Federal Aid Highway Act, and construction workers carefully carved its 14-mile path through the Northern Panhandle in the 1960s and early 1970s. 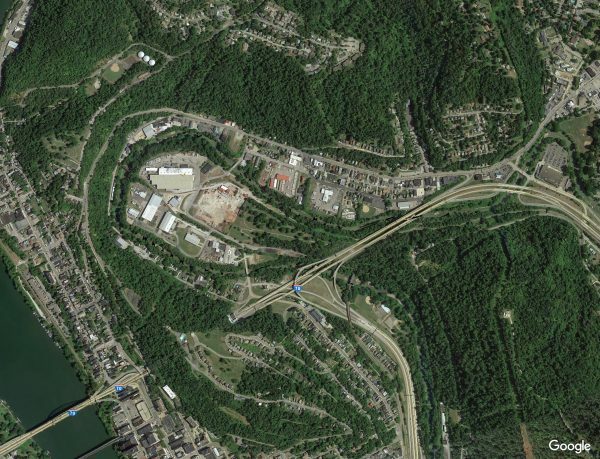 Hillsides were trimmed, homes vanished, and access ramps were created for Dallas Pike, Elm Grove, Pleasanton, Woodsdale, downtown and Wheeling Island before crossing into the state of Ohio. But to reach Wheeling Tunnel, interments were exhumed, and the Peninsula Cemetery was chopped. “Could you imagine having the contract to move all of those graves? 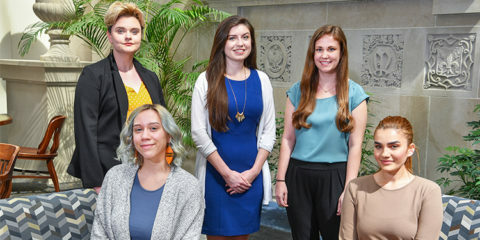 Now, many years ago, I was told that the guys who worked that project would all hang out in this one bar, and I was told some of the stories that were told were just unbelievable,” Brennan said. “One of those stories involved those guys exhuming a body that was buried straight up and down. I just thought that was very strange when I heard that, but I guess that’s how some people wanted to be buried. When the cemetery opened in 1841, it extended from the Fulton area to the Manchester neighborhood before Interstate 70 split the two sides in the 1960s. At the top of the Peninsula Cemetery, fencing stops visitors from coming too close to I-70, but such a barrier does not exist on the Manchester land. It is close to this edge where Karelis found fallen gravestones that appear to be in a purposeful pile. Were remains removed, but the workers left the stones behind? “It’s hard to say what graves were removed because of the records that were kept at the time” Karelis said. “There is a map of the section that was removed, but no one seems to know what remains were removed, and what still remains without the gravestones. Tales of hauntings within burial grounds are plentiful, and cemeteries in the Wheeling area are no exception. At the Peninsula Cemetery, one tale involved a woman in a black cape who, some say, stands over her gravesite. This bird’s eye view from Google Earth reveals the portion of the cemetery that was removed to make way for the interstate. Many of the graves were transported to the Greenwood and Roney’s Point cemeteries. Karelis has heard tales about the Hempfield Tunnel, now known as Tunnel Green and a part of the Wheeling Heritage Trail system. Construction workers perished during the dig for the passageway, a murder reportedly took place within it, and railroad workers were killed when they failed to get out of the way of passing trains. And a cemetery, of course, is located directly above it. “I know there are stories about when the Hempfield Tunnel went through below the cemetery back in 1857,” Karelis said. “Of course, I do not know if they are just stories or if there is any truth to them, but it’s definitely part of the legend. The portion of the Peninsula Cemetery that is on the south side of the interstate has not been maintained for many years. 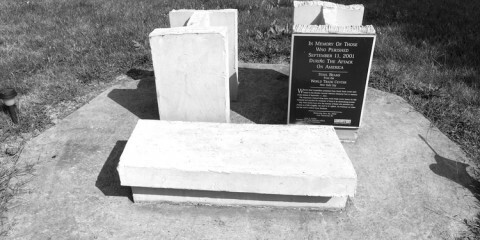 One September in the late 1980s, the Peninsula Cemetery was vandalized to the tune of $42,000. Fencing was damaged, more than 70 tombstones were grounded, and the landscaping was violently disrupted, according to media archives at the Ohio County Public Library. 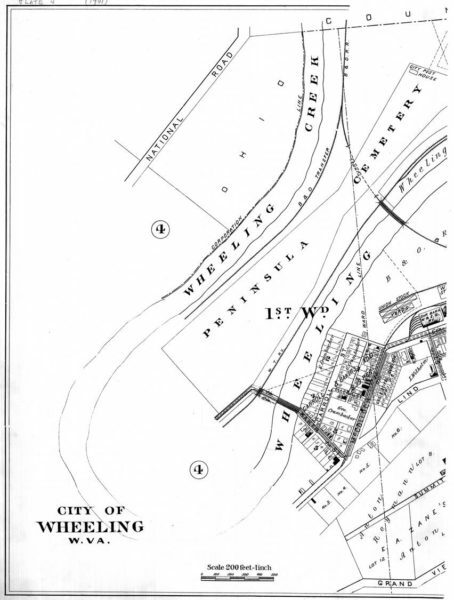 Meanwhile, the other side, the Manchester portion of the original grounds, was left disheveled and has since been ignored, and Finstein confirmed both plots of sacred land belong to the city of Wheeling. 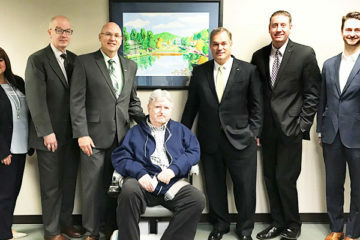 “From what I understand about the Mount Wood Cemetery, and it could have been the case for the Peninsula Cemetery, that there was a cemetery association that had funds, at least for a while, to maintain the grounds,” Finstein said. “But obviously those funds ran out as the older the cemeteries grew, and then, it seems, the cemeteries were handed over to the city. When in one piece, the Peninsula Cemetery was measured at 22 acres and contained more than 1,700 graves. Brennan has dared the rugged terrain where the original burials began, and she has chronicled information from the stones that can still be clearly read. 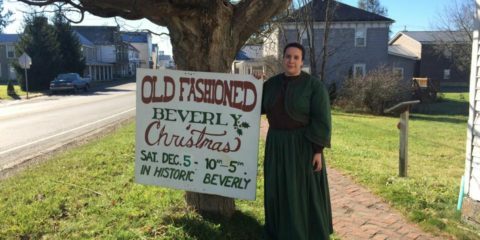 “That area had people from the Civil War there, and also there were whole families. That’s why it’s just a shame that it’s in the condition it is in now. Efforts to further preserve Mount Wood Cemetery will continue this year, but Karelis is not aware of an initiative to solve the mysteries of the Peninsula Cemetery or to beautify the Manchester grounds. The article doesn’t mention that several hundred graves were transferred to Mount Zion Cemetery during the same time period. Very few head stones accompanied them. Most of the names on the records list them as simply unknown. It has been assumed because it was a city cemetery that they had been pauper graves, many perishing in the great flu epidemic of 1918. What an interesting article!!! It is sad that old cemeteries fall into disrepair and another example of how the interstate disrupted Wheeling. My great aunt never got over losing her house to it. Maybe Friends if Wheeling could step in to help restore the grounds??? So sad reading this. I had an aunt who died in 1921 at the age of 1 year and six months and was buried in Peninsula Cemetery but no stone was ever placed. Then in 1922 her two-year-old cousin died and was buried on top of her. Again no stone was ever placed. I now wonder where their bodies lie. 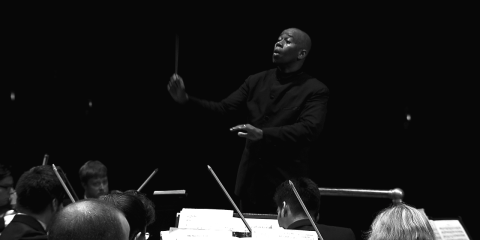 Very nice article, Steve! I’ve visited Peninsula Cemetery many times but I had no idea about the history or that Manchester even existed.